Seahorses' weird shape, with its crazy spines and appendages, not only helps them hang onto and blend into the aquatic vegetation. 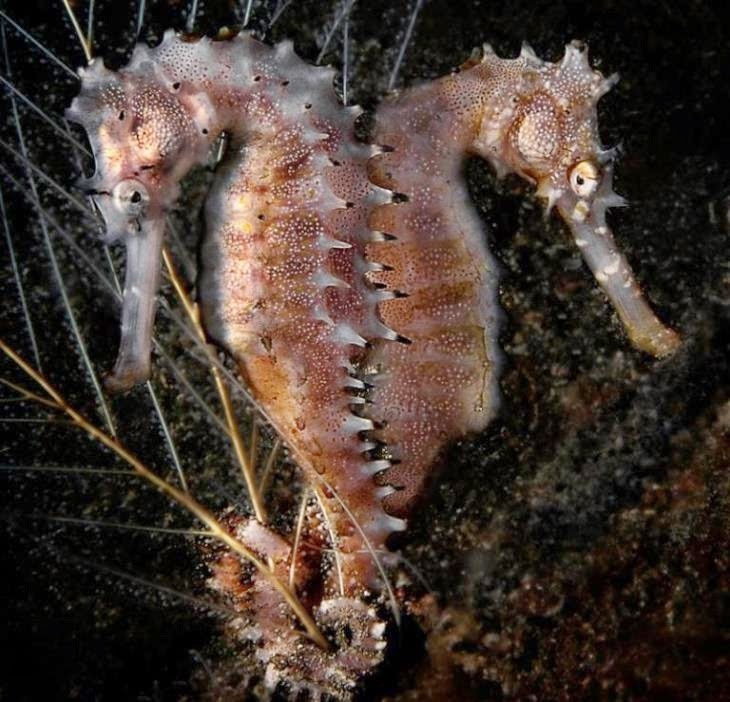 It also helps camouflage their actual movements in the water: the horse shape of the seahorse's head minimizes vibration of water around it, rendering it nearly invisible to its little crustacean prey. 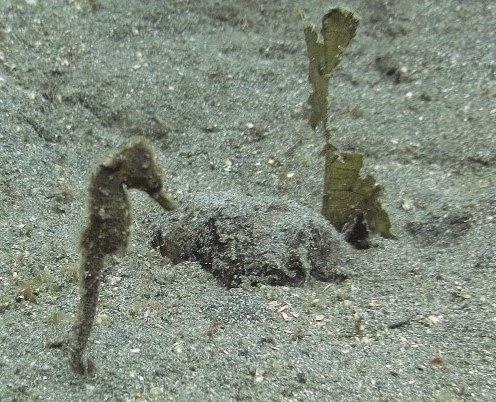 That narrow snout and forward-tilting head help the seahorse hunt by keeping it sonically "hidden" until it is too late for the prey, even for the speedy copepods that make up a bulk of the seahorse's diet. 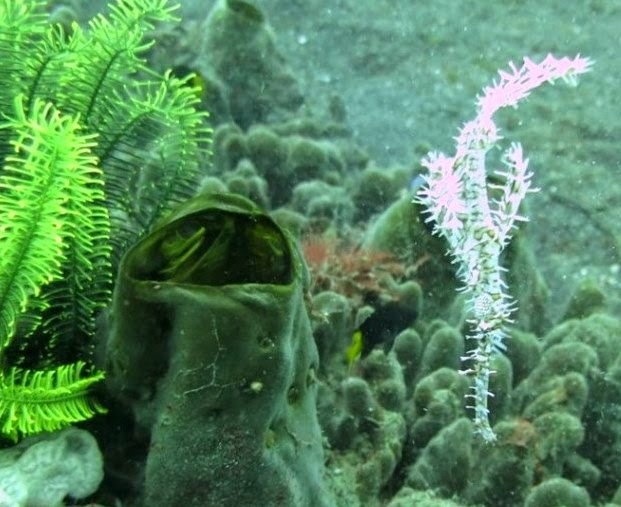 Three seahorses living in the minimal vegetation structure of "muck" habitat in Indonesia - photos by this highly novice photographer on my first underwater photography attempt! Note how they either hang on or bob (seahorse #3) and blend in with their surroundings (yes, some corals are very colorful!). 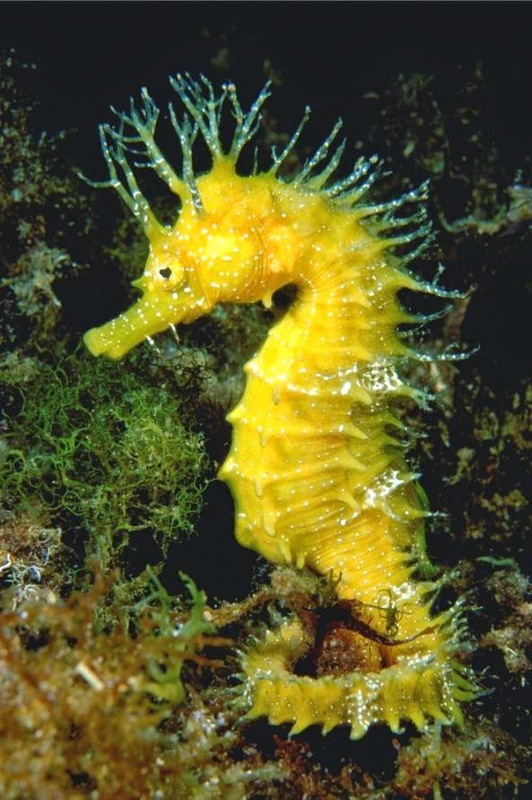 For professional photos of seahorse diversity, click here. 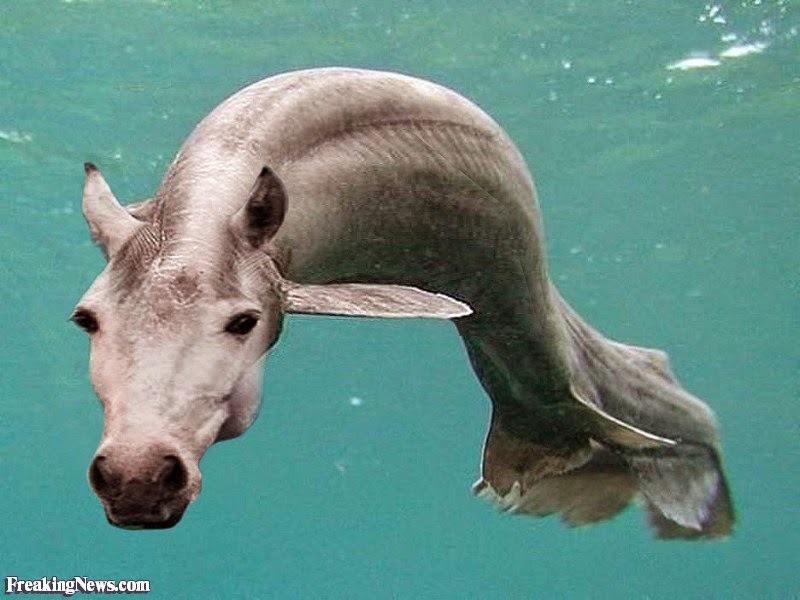 In addition, its bent neck and head act like a spring. While seahorses are latched onto some vegetation with their tails, their curved bodies and upright posture allow them to snap their heads forward to catch their prey faster than you can say "copepod", or even "shrimp". Sort of like a snake. Baam. The ability to snap their head forward also expands the area they have to probe for prey. 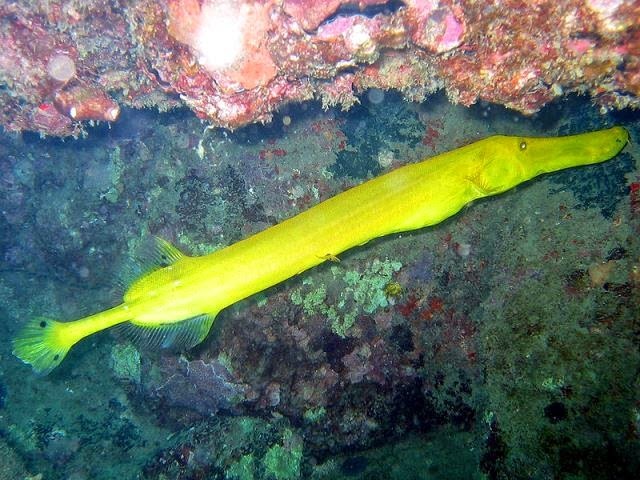 Not only that, but they can use that long tubular snout to poke into nooks and crannies in reefs or rocks to find little critters and then inhale them with vacuum power. Whoa. 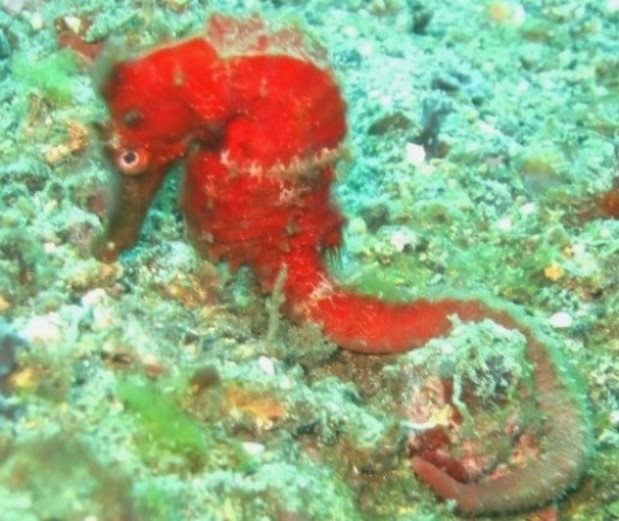 The wavy shape of sea horses might, in fact, have actually evolved to help them better capture prey, researchers now suggest. 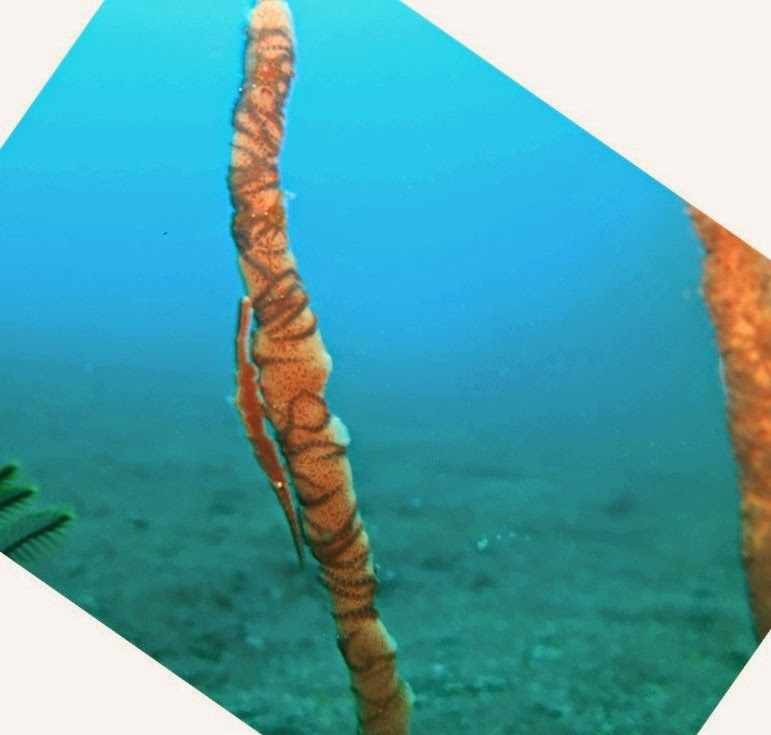 Experiments using high-speed video footage of feeding by both sea horses and their straight-bodied relatives, the pipefish, revealed that sea horses can strike farther than pipefish. As you might guess by now, the ability to strike outward is especially useful for stealth predators like seahorses. Any genetic variation that facilitated the forward strike probably helped its owner chow down a little more frequently and produce a few more baby seahorses (seafoals? 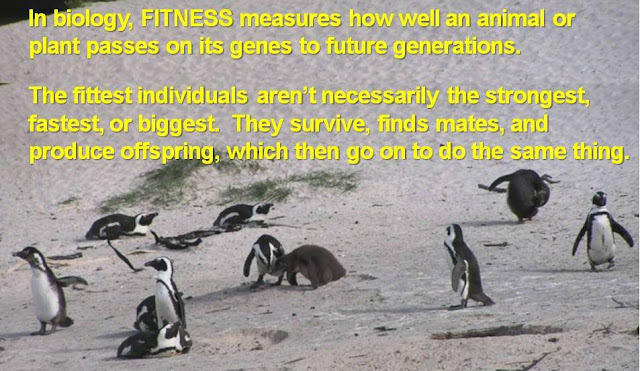 ), who, in turn, were more likely to be successful in catching food than their neighbors who lacked that ability. You can chart the progress from "normal" fish to trumpetfish to pipefishes to seahorse (still a fish!) 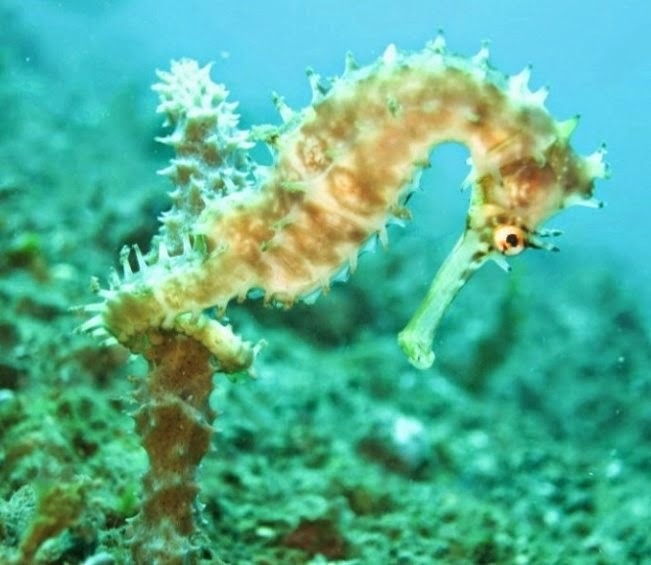 at this beginner's guide to seahorse evolution - or look below. OK, here is the real result, times two! Natural selection IS amazing.